If the goal of the conservatives is to convince the independents and the low information voters that the progressive policies are flawed, conservatives must have credibility when they engage in policy debates. Further, I think that some conservatives are doing themselves and other conservatives a huge disservice by engaging in nick picking of issues that should be left alone. These are issues that even if the premise of the accusation were true, the premise would only show, at most, how disingenuous the statement is. Despite an innate need to prove to the rest of the world how disingenuous some progressives are, independents and the low information voter do not seem to care about the credibility of politicians. I have noticed that as a result of this kind of criticism by some conservatives, the credibility of all conservatives is weakened. In my opinion, those conservatives who criticized the President over these types of issues did so to the detriment of themselves and other conservatives. I say this because many of the people whom they are trying to persuade are not only turned off by this type of argument, but they also will tune out the other conservatives who are trying to make logical debate on the real issues. If the targeted audience is not listening to anything that is presented to them, there is a complete loss of credibility no matter how important the issue may really be. In the case of the President shooting a shotgun: Does it really matter if he has shot a shotgun during his Presidency? 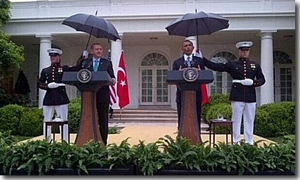 Regarding the Marine holding the umbrella, conservatives should have heaped praised upon the two Marines’ commitment to service and their discipline instead of blasting the President’s conduct. I am still not sure what that bad conduct was. Regardless, such dialogue destroys conservative credibility. Credibility cannot be built by chasing these rabbits of nuance. But, I will concede that at times that someone has to call “BS” on some of the factual statements issued by Progressives and in particular factual statements issued on behalf of the President. Conservatives should focus their debates over progressive policy positions and actions taken in furtherance of that policy. There is more than enough material there for conservatives to defeat progressive ideas without engaging in nick picking. The conservative message needs to be more directed, and less emotional.